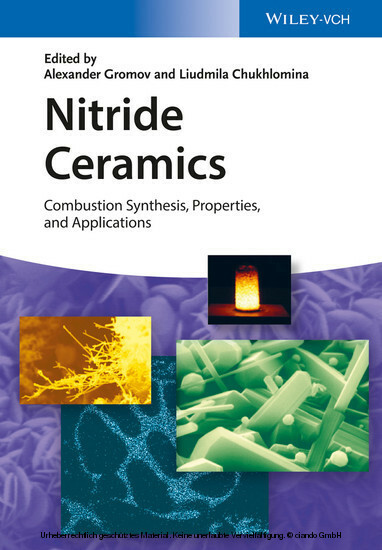 A comprehensive overview of recent developments in the field of non-oxide ceramics with special emphasis placed on the combustion synthesis of group III-VI nitrides and oxynitrides. To ensure the widest possible perspective, the authors are experts in academia, industry, or government research, and each chapter discusses different synthetic methods and process parameters, as well as important material properties and applications. The result is invaluable reading for researchers and practitioners in the industry as well as those looking for an introduction to the field. It is equally of great interest to chemists and materials scientists as well as engineers working in the area of inorganic and solid-state chemistry, structural and functional materials, catalysis, metallurgy, and electrochemistry. Alexander A. Gromov is an Associate Professor at the University of Applied Sciences Georg Simon Ohm in Nürnberg, Germany, since 2013. Having obtained his academic degrees from Tomsk Polytechnic University (TPU, Russia), he spent most of his career working for TPU, KIT (Karlsruhe, Germany), Fraunhofer ICT (Pfinztal, Germany), University of Ulsan (South Korea) and the Aerospace Engineering Department at Milan Polytechnic University (Polimi, Italy). He has authored over 150 scientific publications and several books and has received numerous Russian scientific awards, including the Russian Academy of Science Medal in 2009. Dr. Liudmila Chukhlomina is a leading researcher at the Department of Structural Macrokinetics, Tomsk Scientific Center, Russia, since 1989. She graduated from Tomsk State University (Russia) in 1978 and then worked in the Scientific Research Institute of Applied Mathematics and Mechanics by Tomsk State University. She has authored over 130 scientific publications and several books and is also a reviewer for the Russian Foundation for Basic Research. Metal and nonmetal nitrides are remarkable compounds characterized by a great number of valuable and interesting properties such as high chemical stability in different aggressive media, heat resistance, ability to transition to superconducting state, excellent semiconducting and dielectric characteristics, high hardness which is sometimes close to that of diamond, and so on. Nitride ceramics is widely applied in various industries, for example, electronics, ferrous and nonferrous metallurgy, aerospace, and nuclear power engineering. It is not surprising that since the time when the first nitrides were obtained, active investigations have been carried out to understand the character of nitrides, their behavior and relationship of their properties with peculiarities of their structure, and chemical bonds. The increasing requirements to the quality and operation properties of nitride ceramics make the researchers improve the available synthesis methods and develop new efficient technologies. Self-propagating high-temperature synthesis (SHS) based on combustion processes [1-6] is one of the leading methods of investigation of theory and practice, structure and phase formation of nitrides in the combustion mode, development of new variations of synthesis and technology of nitrides and composite materials thereof, and items and parts based on nitride ceramics for various application purposes. By this time, a lot of articles have been published in all the spheres of the exploration. Their level is constantly being increased. In this chapter, we try to analyze the investigation results of regularities and mechanism of metal and nonmetal combustion in nitrogen as well as structure and phase formation of nitrides, which appear to be less known or unpublished in literature. Besides, we demonstrate some scientific and practical achievements in development of SHS powder technology of the most important nitrides, direct synthesis of SHS materials and items based on nitride ceramics, and some examples of their practical application. The presented information employs the experimental work carried out at the Institute of Structural Macrokinetics and Materials Science of the Russian Academy of Sciences. The first regularities of nitride structure were established by Hagg . He gave the definition of the primary structures in which nonmetal atoms penetrated into the metal crystal lattice and called them " penetration structures ." Face-centered cubic, volume-centered cubic, hexagonal compact, and hexagonal simple types of lattice are the most common for the penetration structures. According to Hagg, transition-metal nitrides (metal-like nitrides) are typical penetration structures. The penetration phases are often considered as heterodesmic compounds with complex superimposition of covalent, metal, and ionic bonds. Many scientists think that the combination of the bonds is the main reason of the extraordinary behavior and unique properties of nitrides. So-called nonmetal nitrides, for example, BN, Si3N4, AlN, and so on, are mainly characterized by covalent bonds and appear to be actual chemical compounds. The works in SHS studied the regularities and mechanism of phase and structure formation of both types of nitrides: metal-like and nonmetal.